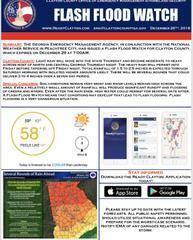 Summary: The Georgia Emergency Management Agency, in conjunction with the National Weather Service in Peachtree City, has issued a Flash Flood Watch for Clayton County, which expires on December 29 at 7:00AM. Clayton County: Light rain will move into the state Thursday and become moderate to heavy across most of north and central Georgia Thursday night. The heavy rain will persist into Friday before tapering off Friday night. Total rainfall of 1.5 to 2.5 inches is expected through Saturday morning with isolated higher amounts likely. There will be several rounds that could deliver 3 to 4 inches over a seven day period. Special Concerns: Soil conditions remain very moist and river levels remain high across the area. Even a relatively small amount of rainfall will produce significant runoff and flooding of creeks and rivers. Even after the rain ends, high water could persist for several days after.